Quality semi-custom boat covers by Oceansouth, suitable for open boats such as tinnies, from 3.5m to 5.6m in length. Available in three colours - black, grey (smaller sizes only) & blue (larger sizes only). Refer to the table below for colour choices for each size. These Oceansouth boat covers, with a wider cut across the beam, are tailored to provide a smooth fit across the boat and around the hull. They are supplied complete with tie-down straps. They are designed to fit boats with bow rails up to 150mm high. This boat cover is suitable for towing up to highway speeds. Manufactured from Cyclone™ woven polyester fabric 300g/m2 – 9 oz/yd2 providing complete weather and UV protection. Length of the boat - over obstructions. Length of the boat - straight line. Width of the boat - straight line. Add 1 metre to measurement "A". Add 1 metre to measurement "B". Review the table of sizes below and find the cover with a Cover Length at least as long as distance "A" + 1 metre. This will ensure you get a cover with enough fabric to cover obstructions and also wrap around the bow by 50cm and the transom by 50cm. Ensure the cover from Step 4 has a Cover Width at least as long as distance "B" + 60cm. This will ensure the cover has enough fabric to extend below the gunwales by 30cm on each side. If not then move to the next size up. 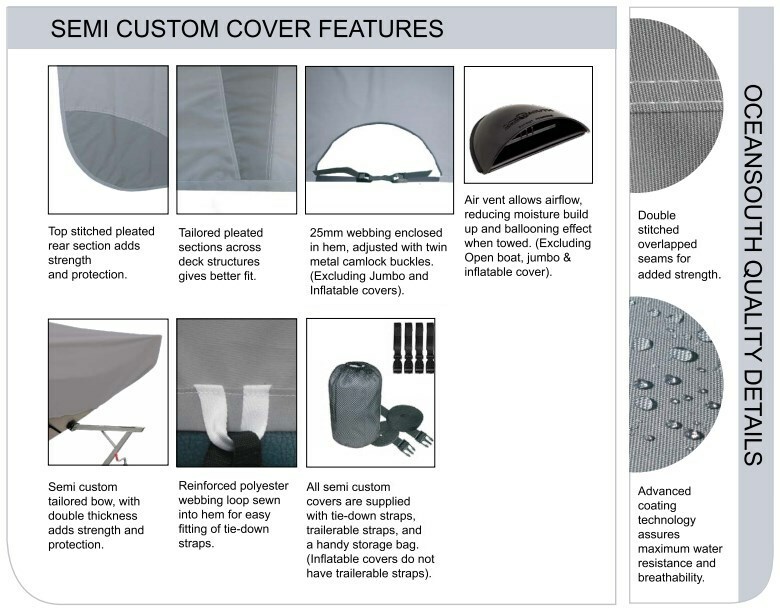 If the largest cover is still not big enough, have a look at the other styles of boat cover for something suitable. Need help? Call us on 02 9450 2912. Great quality material. Very happy with the purchase. Great price and great quality. It arrived after just a couple of days. Fits great. I had previously owned a cheap boat cover which didn't last too long. However the Oceansouth cover that I purchased through Boat Warehouse seems to be a much higher quality. The fit is excellent and it is easy to fit and to remove. I am very happy with this product. I was so surprised at how good the cover is for the price! The cover is good, the straps are useful and it fits well to size as described. I bought two of different sizes, for two boats only a foot apart in length. Both fit reasonably considering they are yachts and not power boats. My only concern is that there is a semi circular cutout at the stern to allow an outboard motor to be accommodated. This was not clear from the pics and leaves me with a hole in coverage at the stern. Also the rope in the hem of the cover can be used to tighten the cover and that works OK. I've had other covers with an elastic strap that was more effective and easier to use. Very pleased with the open boat cover ,fast delivery,quality and fit was excellent. Great semi custom cover that fits very effectively. Good quality. Easy to use boat cover. Would recommend this product. Easy to use and very effective. Wasn't able to get it in black as we wanted however the grey worked out much better as it doesn't show the dirt and dust as much. So worked in our favour. Postage was super quick and was delivered to our door! Perfect. Customer service was helpful and efficient. Real quick delivery to Qld. Nice snug fit and great weight fabric good quality fixings with rope in hem to tighten under gunwhale and good clean action to secure on boat. Click the button below to add the Boat Cover - Open Boat to your wish list.